Against a polarizer filter concealment is futile. A too-quiet Saturday evening at ROTA Gallery. Works by young local artists hang on walls, sit on pedestals, ready to be viewed. But hardly anyone shows up for the opening reception. Creativity unappreciated. Three ROTA volunteers patiently wait during the two hour duration. An adult artist comes in, chats, passes the time with them. Towards the end of the reception a young couple wanders by, checks out a few works before leaving. Not the lowest attendance I've seen at a reception. One time I was at a gallery much greater in size and therefore greater in emptiness. Only three people showed up: me, the artist, and a gallery volunteer. Neither gallery operators nor patrons are at fault when this happens. It can occur with any event: forces beyond control result in low attendance. Maybe this reception at ROTA couldn't compete with the warm sunny weather, especially after a prolonged rough winter. Memorial Day is Monday; people distracted by three day weekend. But quality isn’t a reason why for the lack of visitors. The Youth Member Art Show is better than some shows I've seen featuring older, more experienced creators. 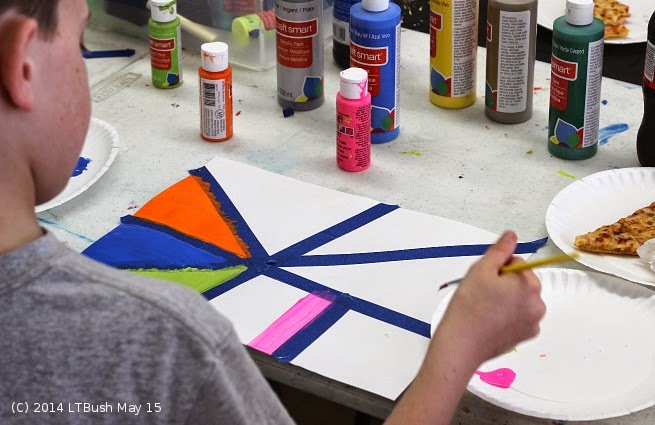 A diverse selection of clever and eye-catching works by artists ranging from kindergarten to high school age: cartoons, paintings, crayon drawings, sculpture, construction paper forms. The neophytic artwork still waits to be viewed and appreciated until June 9th. Gallery hours (depending upon volunteer staffing) are Thursday through Sunday, 2 - 7 PM. More info: rotaexhibitions@gmail.com . 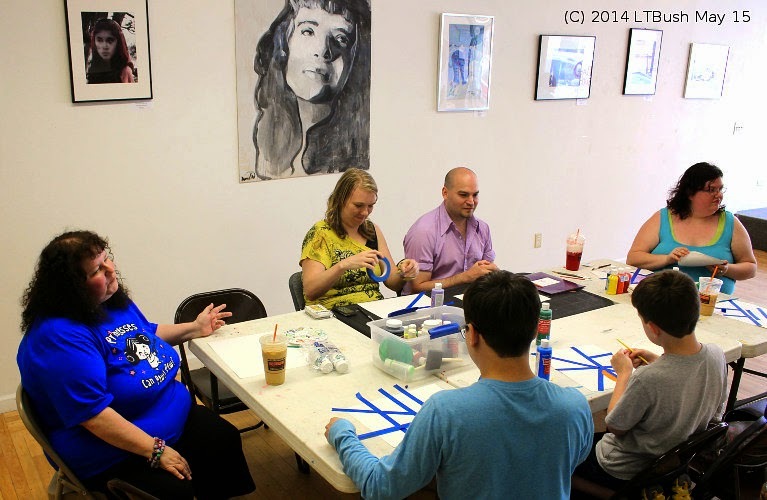 Impeerium Peer Specialist Terri Sartoris (left) chats with the other participants in the Creative Expressions Group at ROTA Gallery. A sunny Thursday afternoon. Folding tables and chairs are hauled out from the ROTA Gallery storage room and then are set up in the center of the main floor. 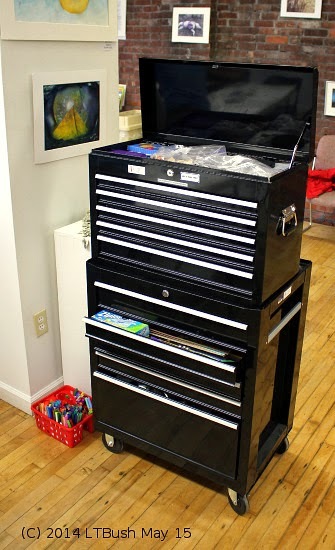 As participants sit down group coordinator Terri Sartoris wheels out a large black cabinet -- the Art-A-Tron 5000 -- its shelves filled with creative materials and tools. Today’s project is taking a blank sheet, taping down areas on the paper with tape to form sections. 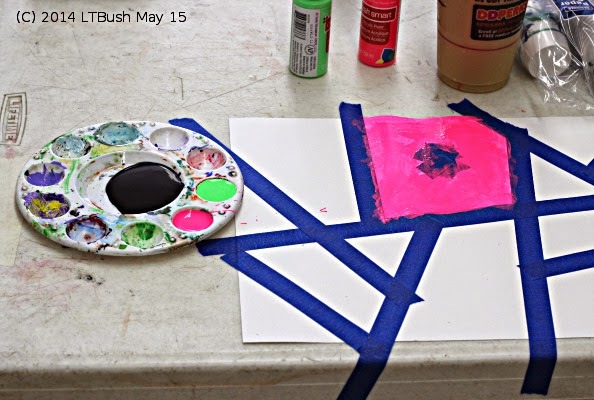 Then paint is applied, wet brushes giving each section its own color, individuality. The participants chat. Calm creativity. Pizza slices are distributed in honor of one person’s birthday. 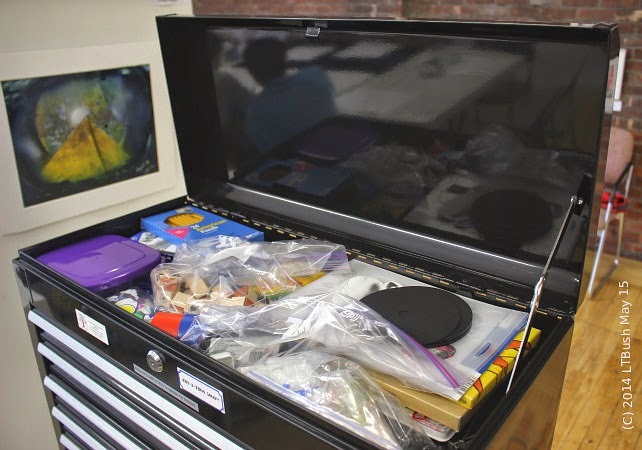 For more information on the Creative Expressions Group you can contact Peer Specialist Terri Sartoris at terri@nami-cv.org or 518-324-6250 ext:12. 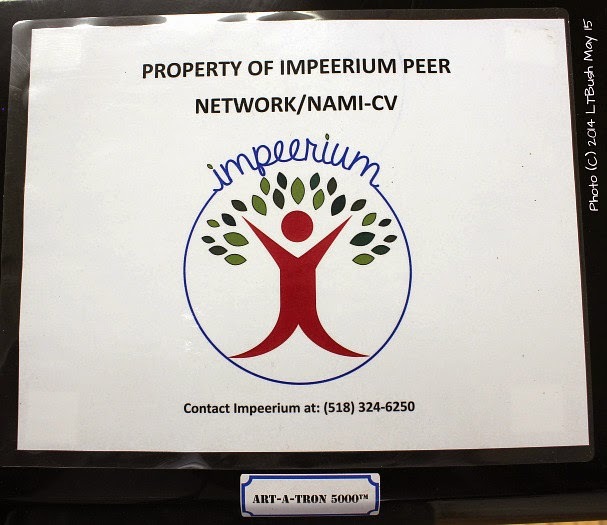 General info about Impeerium: Amy Belair, amy@nami-cv.org or (518) 324-6250. Office address: 14 Healey Ave, Suite E, Plattsburgh, NY. CCPT Planning Technician James Bosley (center) addresses a public meeting in December 2013 regarding changes with Medicaid client transportation services to medical appointments. Scratch the surface a bit and grumbling is easily heard regarding the Clinton County public bus system. Complaints about the elimination of routes and stops. Criticism that the full story remains unreported about what caused the financial shortfall. James Bosley, Planning Technician for Clinton County Public Transportation (CCPT), faces these negative reactions. During a public meeting in December he stated that he was trying to operate the best possible system but it was impossible to please everyone. CCPT serves our area with fixed route buses and also paratransit vehicles for disabled citizens. It depends on the Government, both federal and state, for assistance with its operating funds. The financial shortfall was covered in the media – Press-Republican newspaper and WPTZ-TV – but not in any great detail. Critics (yes, everyone is a critic, especially ones who prefer anonymity) contend that the public is unaware of the real reasons for the shortfall. James Bosley, CCPT Planning Technician, explained his side of the story via email when responding to my questions. Brief background: New York State funding. STOA (State Operating Assistance) program sends CCPT funds in five payments, four quarterly payments in one calendar year, and a fifth one in February/March of the following year. This fifth one is part of a “clean-up” pool that can increase or decline each year. What’s in the pool is distributed to public transportation systems across the state. 2012: Anticipating a decline in STOA (state) funds CCPT cuts low-ridership routes, reducing costs. Despite a decline in the three previous years there was a significant increase with the STOA payment anyway. Excess funds rolled over into next year. 2013: Unexpected drop in ridership, about 10% overall, due mainly to fewer residents at Clinton Community College dormitories. STOA remains steady. Excess funds rolled into this year from 2012 results in less federal operating assistance. 2014: In February the STOA clean-up payment to CCPT is about $50,000 less than the previous year. Increases with other service areas in the state means smaller funding pool. CCPT anticipates STOA clean-up funds will not increase this year, looks for ways to minimize amount of local tax dollars needed. The Gov giveth, then taketh away. Trying for the best CCPT cut routes and costs but ended up with an excess in one year because the STOA payment didn’t decline but increased. The excess meant less federal funding. Then this year the STOA clean up portion for CCPT was unexpectedly less than anticipated. As James explains the 2012 STOA increase was "counter-intuitive" to CCPT having just cut back on some routes. 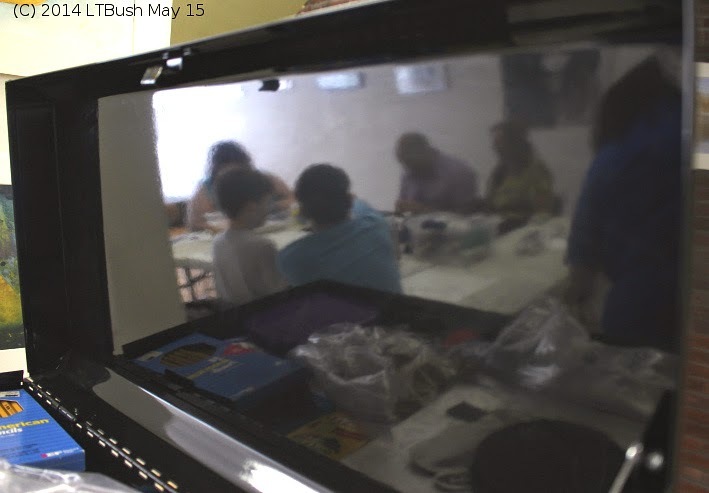 He continued: "After $50,000 less in clean-up and an unexpected $13,000 water lateral replacement at the bus facility, CCPT ended up with a budget shortfall of $33,000 for 2013." But critics contend that’s not the full story. They question why routes were eliminated while the federal government still provided funding as long as minimum ridership was maintained. This situation reminds me of the stories I heard back in the day when the Plattsburgh Air Force Base (PAFB) was active. The base would think up “needed projects” to maintain the same federal funding. If the numbers didn’t stay up then it would receive less. So there was a project to completely replace perfectly good slate shingle roofing on an old building with inferior new roofing. A patch job would have been enough. And then there was the plan to hide those large ugly steam pipes running near the base roads with decorative shrubbery. If PAFB didn’t dream these projects up, money would be saved but the base would lose funding. Not an efficient system but that’s how the game was played. CCPT critics also maintain there was no reason to cut routes and lose federal funding. The cuts saved money but lost it in the long run. As for the routes that were left, according to the critics, some popular stops were dropped without good reason. For example, the bus used to stop at the Hannaford Supermarket exit, an enclosed area that provides shelter from inclement weather. Now both shoppers and store employees are dropped off near the supermarket but out in the open on a side road. This stop has to be requested, another inconvenience for riders. And inconvenience is not what a public bus user wants. Either way – management’s story or the critics’ POV – saving has meant losing for CCPT. And James Bosley has a difficult job as he deals with variable funding and trenchant criticism. 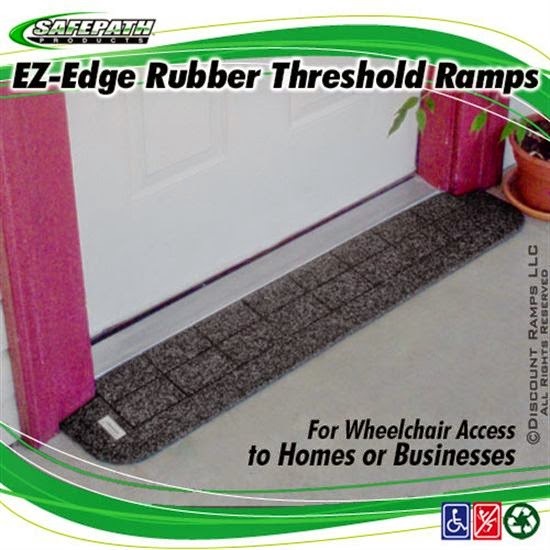 An example of what can be found online for wheelchair threshold ramps. Note to ambulatory citizens: the next time you're in downtown Plattsburgh pretend you're in a wheelchair while entering various locations. What can be accomplished in one easy step, you'll notice, is difficult, even impossible, for a wheelchair user. Many entrances downtown are raised above the sidewalk level. Even two or three inches in height can impede a wheelchair. This issue was raised recently when an event for a political candidate was scheduled at a downtown restaurant. It was pointed out that wheelchair users couldn't enter the business unless special arrangements were made. For now the issue with this particular place seems to have been resolved but there are many other places not compliant with ADA (Americans With Disabilities Act) regulations. A shown in a previous post - Accessibility Available - an inexpensive wheelchair ramp made of scrap wood can do the job, putting it in place as needed. Finding solutions is as easy as Googling keywords like "wheelchair threshold ramps" or "portable wheelchair ramps." 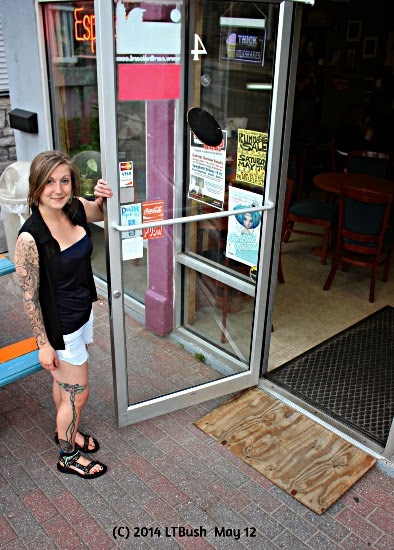 Businesses and shops downtown don't have to necessarily spend money for new construction to be ADA compliant or take the time to make a DIY ramp. Smooth Moves employee Alyssa shows the portable wooden ramp that is provided upon request for wheelchair users. The ramp is lightweight, constructed with inexpensive plywood. Smooth Moves, a smoothie-milkshake shop/eatery, is located at 4 Broad Street.